If aging, sun exposure, genetics, and other factors have damaged the appearance and elasticity of your skin, you may want to consider laser skin resurfacing. In this minimally invasive procedure, a laser is used to vaporize the damaged layers of skin and to remove areas of wrinkled skin. The result is a minimized appearance of fine lines and even of facial scars or areas with uneven pigmentation. Together, you and your doctor will determine if you are a candidate for ablation (more intense skin removal) or non-ablation (less intense). Why Should I Consider Laser Skin Resurfacing? In this procedure, FDA-approved lasers are used to target areas of the skin and induce the production of new, undamaged skin cells – resulting in a smoother, more youthful appearance. The doctors at Bruno | Brown Plastic Surgery are expertly qualified to determine what the best methods to achieve your desired appearance. At your complimentary consultation, your doctor will help you determine how to best meet your needs and whether you might benefit from compatible procedures such as Botox or Juvederm. 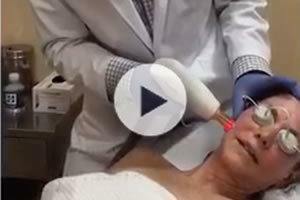 Are you interested in laser skin resurfacing?